"I think we're past the point where you need to spend twenty years as an officer before you can be considered for command. We need to promote exceptional officers quickly. We need our captains leading away teams. Starfleet needs to look at our whole command structure and do what works now, not what worked 30 years ago." An MMO developed by Cryptic, makers of City of Heroes and Champions Online, set in the original Star Trek universe in the year 2409, thirty years after the last appearance of the Next Generation crew in film, and 22 after Romulus was destroyed in the prime timeline as per Star Trek XI. The game was originally being developed by Perpetual, but was auctioned off as the studio was facing severe financial troubles at the time, and actually had to lay off nearly half of the development staff. The Borg are back, deadlier than ever before, and the galaxy is once more on the edge of war. The Federation and the Klingon Empire are at each other's throats again, and the tattered remains of the Romulan Star Empire post "Countdown" may be scattered, but they remain a credible military threat to both, and to the fledgling Romulan Republic. That's only compounded with a newly democratic Cardassia facing a civil war against True Way rebels helped by Dominion renegades, and the Undine (formerly known as Species 8472) infiltrating everyone. In other words, the 25th century Star Trek universe has become a Crapsack World (relatively speaking), and it's up to the player(s) to find a way to make it right. The game combines space travel with on-foot segments and a healthy dose of combat in both. A proprietary engine was created to randomize missions, star systems, and planetary surfaces, in order to provide new and different experiences every time a player engages in a mission or quest. And, of course, being a Cryptic game, Character Customization is suitably bonkers and may in fact eclipse every other thing they've done. You have an absolutely astounding number of ways to customize your captain; not only has almost every facial feature from the TV series been included, but Cryptic has included all kinds of inventions of their own. And then they allow you to apply the same level of customization to your entire bridge crew. And then you get to customize the hull of your ship, and then you get to customize your bridge with further interior customization and... well, you get the idea. Oh, and you can create a new custom species for your captain. The general consensus is that the game is essentially a mix of World of Warcraft IN SPACE! combined with Star Trek: Starfleet Command... and this isn't necessarily that bad a thing at all. Especially with "Featured Episodes", small content updates centered around a fairly lengthy and involved mission, the advent of a pretty good branching dialogue tree on top of the combat, and most recently very solid "themed" patch updates, the game has found a fairly solid set of legs and and a strong following after an admittedly rocky start, and is now Cryptic's best-selling, most profitable product. When the game started, there were only two playable factions: the Federation and the Klingon Empire. After three years of rumors of more factions being added, the Legacy of Romulus expansion adds Romulans and Remans as playable races, along with iconic ships like the Bird of Prey and the D'deridex Warbird. Additionally, there's been discussion from the devs of a possible future Cardassian faction, but no official confirmation that it's going to happen just yet. 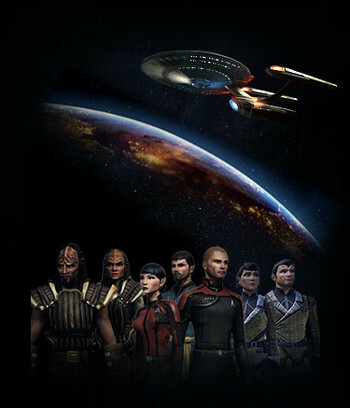 On August 2, 2014, STO's second expansion, Delta Rising, was announced with a release date set for October 2014, advancing the timeline to 2410, adding the first level cap increase in years (to 60 Fleet Admiral/Dahar Master), and returning the players to the Delta Quadrant to explore what happened after Voyager left the area. On May 5th, 2016, Cryptic announced STO's third full expansion, Agents of Yesterday, to be released in the summer - adding the TOS-era starfleet as a starting faction with its own storyline and new original series themed ships. On May 12, Cryptic announced that the game, previously a PC exclusive, would receive a PlayStation 4 and Xbox One port in the fall. On March 21, 2018, Cryptic announced STO's fourth full expansion, Victory is Life, to be released that June, — adding in a brand new faction with the Jem'Hadar, obtaining playable Cardassians for the Federation and KDF, a new Level Cap raise to 65, reuniting most of the cast of Star Trek: Deep Space Nine and sending players into the Gamma Quadrant. On July 26, 2018, Cryptic announced STO's fifth full expansion, Age of Discovery, which makes it the first game to work in lock-step with Star Trek: Discovery. Players will be able to create a Discovery-era Starfleet character and journey to different Discovery-era locations. As well, actress Mary Wiseman will reprise her role as Cadet Sylvia Tilly to help players on their way. The game went Free-To-Play on January 17, 2012, with the standard Subscription option containing boosts such as more wallet space, the ability to create content in the Foundry, a stipend of Zen (their Store Points), and so on, so lifetimers don't have to feel cheated at the game going free. In addition, all players can earn dilithium from end game content to trade in for Zen, allowing players who can't afford to spend real money on the game the opportunity to grind their way towards the store items they want. Another unique feature of the game is the Foundry, an in-client Level Editor toolset for players to create their own missions that can then be played from a storefront in the main game. As with anything else Sturgeon's Law applies, but the game has an established core of dedicated Foundry authors that gather on the forums and on Starbase UGC.com and produce missions that are often rated as being better than the official outings. A sparsely populated list of work pages for some Foundry missions can be found at Recap.Star Trek Online. Cryptic also ported the editor to STO's sister game Neverwinter. However, on 4 March 2019, Cryptic announced that they would be shutting down the Foundry on 11 April. The game is considered part of the Star Trek Expanded Universe, but is an Alternate Continuity to the Novel Verse: to wit, much of the background material is borrowed directly from the early novels, but most of the events starting with Star Trek: Destiny just flat-out do not happen.